A school in Yekaterinburg, Russia’s fourth-largest city, held a contest earlier this month for the UN’s International Day for Tolerance. Students submitted drawings, and many of them were displayed in the school. The drawing shows three pairs of symbols: one with two male symbols, one with two female symbols, and one with a male and a female symbol. This prompted an investigation by the Education Department, since a 2013 law in Russia bans showing “propaganda of non-traditional sexual relationships” to minors. An Education Department spokesperson said that no “propaganda of sexual minorities” was found in the drawings. 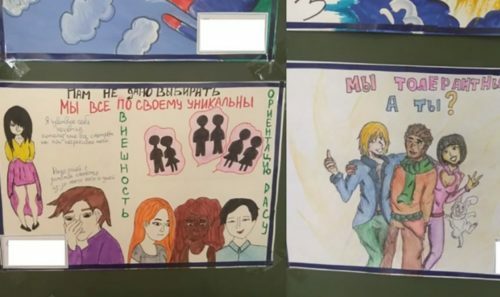 Psychologists were also sent to the school, according to the news site Meduza, to conduct “outreach work” and “clarify the drawings to students and parents.” But they said that the pictures did not qualify as gay propaganda. That didn’t satisfy the police, though. Seventeen of the pictures have been seized and an investigation into the school has been opened. “We’re now checking if this event was really dedicated to the day of tolerance,” said a spokesperson for the Sverdlovsk regional police.